i made this last week for my mother in law's birthday. i believe it will be a good one to keep on hand, as it is a simple cake that can be adapted in various ways. 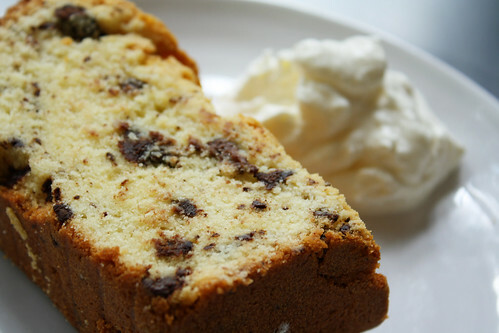 the chocolate chunks added depth to the flavor, and a bit more richness. i halved the recipe and baked in a loaf pan. 2. place the butter and cream cheese in a large bowl of mixer and beat on medium speed until smooth. add the sugar, increase speed to high, and beat until light and airy, at least five minutes. add the eggs, one at a time, beating after each addition and scraping down the sides of the bowl as needed. add the vanilla, almond, then the flour and salt all at once. beat until just incorporated. 3. pour the batter into the prepared pan and shake it lightly to even out the top. bake until cake is golden brown and a toothpick inserted comes out clean, about 1 1/4 hours. 4. place the pan on a cake rack and cool for 20 minutes, then remove cake from the pan and let it cool completely. serve at room temperature.